"The 22-foot high cedar A-frame at the House of Industry barn was taken down in 2014 because it was rotted through. 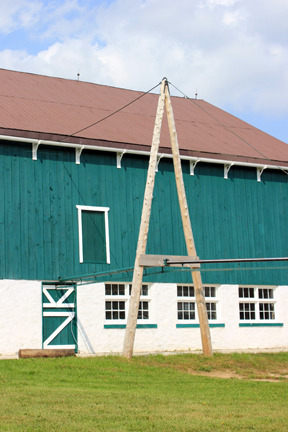 It was originally installed probably in the mid-1930s when the manure carrier system (made by Beatty Bros Ltd of Fergus) was installed in the House of Industry barn as one of the many labour-saving devices available to farmers. 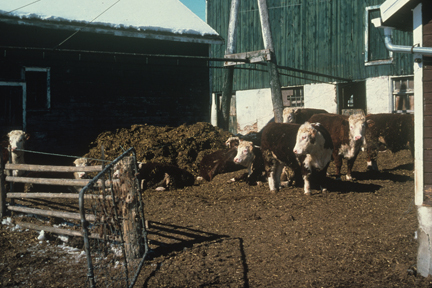 Mucking out cattle manure into wheelbarrows and disposing of it in the paddock was a very strenuous job. The carrier system was installed on a track that ran the length of the stalls so that the bucket could be filled as the stall was mucked out. The track, supported by the A-frame, extended outside to the manure pile, saving manpower and time." The A-frame shown on the right and above replaced the one described by Susan. The original is shown below when it was part of a working farm operation. When I received the pieces of the old A-frame I took them to the sawmill and had them cut into planks approximately 1 1/2" thick. It was only after doing this that I noted that one edge of each plank was highly textured. The other edge had the same dark colour but had a much more uniform surface. 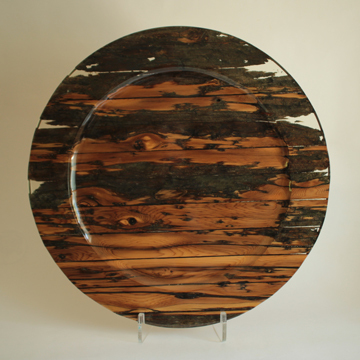 I wondered if the textured edges could be concentrated and shown off as, possibly, a platter. As you can see in the detail on the right from the above photo, the surfaces of the supports below the cross member have weathered differently than those above the cross piece. Because one side of each plank was considerably rougher than the other, I assumed that one side of the A-frame faced the weather and the other was in the lee. However, when I received the photograph above, taken in 1978, it is apparent that the A-frame was fairly well protected, having a building, in close proximity, on each side of it. As you can see in the image at the top of this page, the building on the left has been removed. Making this platter involved some new thinking and trying out new ideas and approaches. For more on this, please click here. 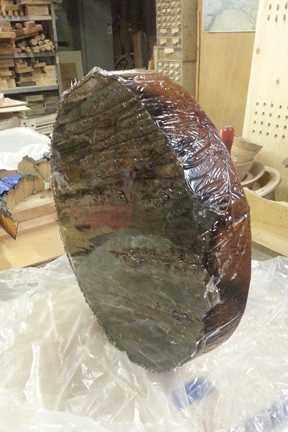 The image on the right shows the turning blank after it had been removed from the mold. In the upper half one can see the textured surface but in the lower section there is only the reflection of the table surface. The epoxy completely covered this part of the blank. This made for an interesting turning process as the epoxy is considerably denser than the cedar and the added weight tended to counter-balance the blank. This A-frame replaced the original in 2014. Photograph provided by the Wellington County Museum & Archives. This is a detail from the image on the left. Note the weathering on the A-frame supports below the cross bar. I called the piece on the left "A Sign of the Times". 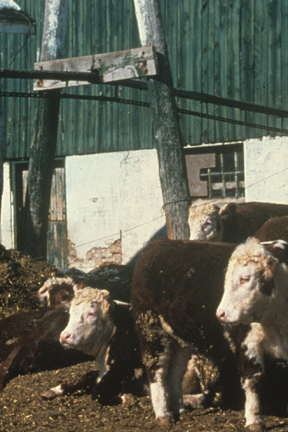 The barn and farming practices at the House of Industry and Refuge changed as new products and ideas were tested and proven to be enhancements or time savers. While the A-frame was part of the evolution of cleaning a barn, so was the design and construction of this platter part of my on going study of my craft.